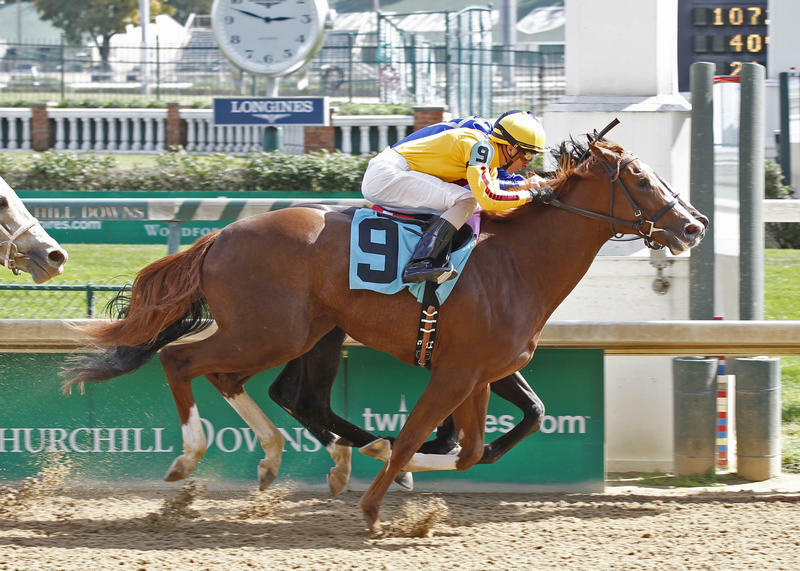 Locust Grove entrant Keen Pauline broke her maiden at Churchill Downs during the 2014 September Meet. Credit: Reed Palmer Photography. Meetings between rising 3-year-olds and more mature and accomplished elders during the late summer and fall are anticipated events in any racing year and that scenario is set for Saturday at Churchill Downs when Stonestreet Stable’s Keen Pauline, winner of Pimlico’s Grade II Black-Eyed Susan, battles a strong field of older fillies and mares topped by multiple stakes winning mares Frivolous and Flashy American in the $100,000 Locust Grove Stakes (Listed). The Locust Grove is one of four stakes races on the first Saturday program of Churchill Downs’ 11-day September Meet. The 1 1/16-mile race for fillies and mares aged 3-year-olds and up, which will be run for the 32nd time, is scheduled as the 10th race on an 11-race program that begins with its first race at 12:45 p.m. (all times EDT). The Locust Grove start is set for 5:20 p.m. Keen Pauline will face older foes for the first time when she meets 11 older rivals in the Locust Grove. The Dale Romans-trained daughter of Pulpit rolled to a 2 ¾-length upset victory over future Grade I winner Include Betty in the 1 1/8-mile Black-Eyed Susan on Preakness Weekend at Pimlico. The win under jockey Javier Castellano was only her second in seven career races and she failed to contend in her next outing, a sixth-place finish in Belmont Park’s Coaching Club American Oaks (GI). Paco Lopez will be in the saddle as Keen Pauline returns to competition at her home base at Churchill Downs, where she notched the only other victory of her young career in a dead-heat win in a seven-furlong maiden race during last year’s September Meet. Keen Pauline faces a significant challenge in her first outing against the Locust Grove’s group of elder rivals headed by G. Watts Humphrey Jr.’s homebred Frivolous, winner of the Fleur De Lis Handicap (GII) and 2014 Falls City Handicap (GII) at Churchill Downs for trainer Victoria Oliver. She was second to Sheer Drama in her most recent outing in the Delaware Handicap (GI) at Delaware Park and that rival returned to win the Personal Ensign (GI) in her next race at Saratoga. The 5-year-old Frivolous ran third to Spinster (GI) winner Don’t Tell Sophia in last year’s Locust Grove and has a career record of 4-4-3 in 21 races with earnings of $606,818. Regular jockey Jon Court will ride Frivolous, who breaks from post six and will carry high weight of 123 pounds. Preston Stable LLC’s Flashy American has been transformed from a $25,000 claiming horse to a graded stakes winner by trainer Kenny McPeek. She captured the 2013 running of the Locust Grove and subsequently won the 2014 Sixty Sails (GIII) at Hawthorne. The 6-year-old daughter of Flashy Bull has runner-up finishes in Oaklawn Park’s Bayakoa (GIII) and Prairie Meadows’ Iowa Distaff this year, but has not won in 11 races since her victory in the Sixty Sails. Corey Lanerie will ride McPeek’s mare, who has a career record of 8-6-4 in 37 races with earnings of $757,183, the highest total in the field. Flashy American, whose Churchill Downs record stands at 3-3-1 in nine races, will carry 121 pounds from post three. Other horses of note in the Locust Grove include Miller Racing’s Call Pat, winner of the Groupie Doll (GIII) at Ellis Park last time out for trainer Brad Cox; Juddmonte Farm homebred Privet Hedge, a French invader and supplemental entry to the Locust Grove making her second U.S. start for Hall of Famer and all-time Churchill Downs win-leader Bill Mott; and minor stakes winners Diva’s Diamond, Cabana and Legacy. In addition to the Locust Grove, Churchill Downs will stage the $200,000 Pocahontas (GII) for 2-year-old fillies, the $150,000 Iroquois Presented by U.S. Bank (GIII) for 2-year-olds and the $100,000 Open Mind for female sprinters. Sea Jay Racing’s 4-year-old filly Spelling Again, trained by Brad Cox, could be the horse to beat in the seventh running of the $100,000 Open Mind, a six-furlong sprint that attracted a compact but competitive field of six fillies and mares. The Pennsylvania-bred daughter of Awesome Again exits a swift second-level allowance/optional claiming event at Indiana Downs where she won one-mile race in 1:36.53 by 1 ¾ lengths over heavily-favored House of Sole. It was her first victory since being claimed for $40,000 at Santa Anita in May and third career win in 12 starts. The Open Mind field from the rail out (with jockey): 2013 Golden Rod (GII) runner-up Bird Maker (Brian Hernandez Jr.), 2013 Dogwood (GIII) third Elusive Fate (Corey Lanerie), Winning Colors (GIII) runner-up Heykittykittykitty (Ricardo Santana Jr.), West Virginia Secretary of State runner-up Brown Eyed Mary (Carlos Lugo), Spelling Again (Shaun Bridgmohan) and Brandywine runner-up Anusara (Jose Ortiz). All carry 120 pounds. Post time for the Open Mind, which goes as Race 5, is 2:45 p.m.